The Canadian Conference of Mennonite Brethren Churches initiated the creation of the Mennonite Brethren Archives in 1969, at which time Herb Giesbrecht, the librarian for the Mennonite Brethren Bible College (MBBC), was permitted to spend a quarter of his time in archival work (Canadian Conference Yearbook, 1969, p.83). In 1973, the archivist was responsible to the Board of Higher Education and the Historical Committee was established as a sub-committee. By 1976, the Centre for Mennonite Brethren Studies was established at MBBC in Winnipeg and designated as one of three North American centres, each of which accepted specific responsibilities (the other two centres are in Fresno, CA and Hillsboro, KS). Helmut Huebert acted as Chair of the Historical Committee until 2003, at which time this position was held by Gerry Ediger. The Historical Committee would be dissolved in the restructuring of the Canadian Conference that occurred in 2004. Herb Giesbrecht would remain the Mennonite Brethren archivist until 1979, when Ken Reddig was hired. In 1980, the archivist position became full time, with the archivist also acting as the resident scholar of MBBC. Ken Reddig maintained the archivist position until 1991. After his departure, Abe Dueck took over the archival operations. Not having an archives background, he was named the director of the Centre for MB Studies. Alf Redekopp stepped in as the Centre's archivist, followed by Conrad Stoesz in 1999. Abe remained the director of the Centre for MB Studies until his retirement in 2002. Heinrich Loewen (2002–2004), Ken Reddig (2005–2007), Doug Heidebrecht (2008–2010) and Jon Isaak (2011– ) succeeded Abe Dueck as director. In 1994, when the Board of Higher Education was dissolved, the Historical Committee became a sub-committee of the Board of Communications. A second restructuring occurred in 2002, at which time the Board of Communications was amalgamated with the Board of Christian Education Ministries and the Board of Evangelism to form the Board of Discipleship Ministries (see Board of Discipleship Ministries series for further file listings). In 2004, all boards were dissolved with the implementation of the Governance Model. The Centre for MB Studies was then placed in the care of the Communications department, finally coming to rest in 2008 its current position as a stand-alone ministry accountable to the Canadian Conference executive director. In 2014, the conference ministries were re-framed as "services" and reorganized around four headings: Building Community, Multiplying Churches, Developing Leaders, and Financial Ministries (renamed Resourcing Ministry). The Centre for Mennonite Brethren Studies fits in the Building Community service. This series belongs to the Canadian Conference of Mennonite Brethren churches fonds. The series consists of the correspondence, reports, minutes and projects pertaining to the Centre for Mennonite Brethren Studies and the Historical Commission. Additional reports and correspondence can be found under the boards to which the Centre for MB Studies reported to: Board of Higher Education (1969–1994), Board of Communications (1994–2002), Board of Discipleship Ministries (2002–2004/05), Communications (2004/05–2007). The records come from the files of the Centre for MB Studies, primarily from the period of the first two Conference Archivists, Herb Giesbrecht and Ken Reddig. Records have also been donated by Helmut Huebert, member and long standing chair of the Historical Committee, and Abe Dueck, director of the Centre for MB Studies (1992-2002). Accession No. 's: 1997-029, 1997-058, 1998-037, 2000-034, 2000-052, 2003-028. Related material: Board of Higher Education series [see records of minutes for the Historical Committee, 1973–1984 (Book 14)], Board of Communications series, Board of Discipleship Ministries series, Communications series. Previous classification under the Canadian Conference of MB Churches inventory B244. 1. Historical Committee minutes. -- 1981–1997. 2. Chairman's correspondence. -- 1977–1994. 3.1. Centre for M.B. Studies minutes, reports. -- 1974. 3.2. Centre for M.B. Studies minutes, reports. -- 1975–1977. 3.4. Centre for M.B. Studies minutes, reports. -- 1979. 3.5. Centre for M.B. Studies minutes, reports. -- 1980. 3.6. Centre for M.B. Studies minutes, reports. -- 1981. 3.7. Centre for M.B. Studies minutes, reports. -- 1982. 3.8. Centre for M.B. Studies minutes, reports. -- 1983. 3.9. Centre for M.B. Studies minutes, reports. -- 1984. 3.10. Centre for M.B. Studies minutes, reports. -- 1985. 3.11. Centre for M.B. Studies minutes, reports. -- 1986. 3.12. Centre for M.B. Studies minutes, reports. -- 1987. 3.13. Centre for M.B. Studies minutes, reports. -- 1988. 3.14. Centre for M.B. Studies minutes, reports. -- 1989. 3.15. Centre for M.B. Studies minutes, reports. -- 1990. 3.16. Centre for M.B. Studies minutes, reports. -- 1991. 3.17. Centre for M.B. Studies minutes, reports. -- 1992–1993. 3.18. Centre for M.B. Studies minutes, reports. -- 1993. 3.19. Centre for M.B. Studies minutes, reports. -- 1994. 3.20. Centre for M.B. Studies minutes, reports. -- 1995. 3.21. Centre for M.B. Studies minutes, reports. -- 1996. 3.22. Centre for M.B. Studies minutes, reports. -- 1997. 3.23. Centre for M.B. Studies minutes, reports. -- 1998. NOTE: Numbers 4-19 do not exist. 20. Historical Committee’s terms of reference. -- 1977, 1984, 1988. 21. Archivist’s / Archives correspondence. -- 1971–1972. 22. Archivist’s / Archive correspondence. -- 1973. 23. Archivist’s / Archive correspondence. -- 1974. 24. Archivist’s / Archive correspondence. -- 1975. 25. Archivist’s / Archive correspondence. -- 1976. 26. Archivist’s / Archive correspondence. -- 1977. 27. Archivist’s / Archive correspondence. -- 1978. 28. Archivist’s / Archive correspondence. -- 1979. 29. Archivist’s / Archive correspondence. -- 1979. 30. Archivist’s / Archive correspondence. -- 1980. 31. Archivist’s / Archive correspondence. -- 1981. 32. Archivist’s / Archive correspondence. -- 1982. 33. Archivist’s / Archive correspondence. -- 1983. 34. Archivist’s / Archive correspondence. -- 1984. 1. MB Historical Society of Canada. Advisory and Executive Committee Meeting Minutes. -- 1979–1990. 2. CMBS. Historical Committee and Archives Sub-committee. Meeting Minutes and Correspondence. -- 1980–1984. 3. Aussiedler Issues. -- 1994–2003. 4. Historical Committee. Minutes, Reports, and Correspondence. -- 1995–1997. 5. Historical Committee (CMBS). Minutes, Reports, and Correspondence. -- 1996–1999. 6. Historical Committee. Minutes, Reports, and Correspondence. -- 2000–2001. 7. Historical Commission; Historical Committee. Minutes, Reports, and Correspondence. -- 2001–2004. 8. Centre for MB Studies. Reports and Correspondence. -- 2002. 9. Historical Commission. Minutes, Reports, and Correspondence. -- 2002–2004. 10. Historical Committee. -- 2002–2004. 1. Centennial plaque of the Canadian Conference 1888–1988. Wooden plaque. 2. Mennonite Historical Committee Reports. -- 1981–1988. 3. Centre for MB Studies. Historical Committee Reports. -- 1984–1987. 4. Historical Committee Meeting Minutes and Correspondence. -- 1985–1988. 5. Mennonitische Rundschau Indexing Committee Meeting Minutes. -- 1988–1990. 6. Historical Committee Meeting Minutes and Correspondence. -- 1989–1991. 7. Historical Committee Minutes, Reports, and Correspondence. -- 1991–1992. 8. Mennonite Historical Society of Saskatchewan. Meeting Agenda and Reports. -- 1992. 9. Historical Committee Minutes, Reports, and Correspondence. -- 1992–1994. 10. Historical Committee Minutes, Reports, and Correspondence. -- 1994–1995. 35. Archivist’s / Archive correspondence. -- 1985. 36. Archivist’s / Archive correspondence. -- 1986. 37. Archivist’s / Archive correspondence. -- 1987. 38. Archivist’s / Archive correspondence. -- 1988. 39. Archivist’s / Archive correspondence. -- 1989. 40. Archivist’s / Archive correspondence. -- 1990. 41. Advisory Committee minutes and reports. -- 1976–1981. 42. J.A. Toews Festschrift Editorial committee. -- 1979. 43. Archives Sub-committee minutes. -- 1982–1983. 44. Reading Committee re. Neufeld’s Manitoba MB History manuscript. -- 1983. 45. Archives review committee minutes. -- 1984–1985. 46. Mennonite Historian merger meeting minutes, reports and agreements. -- 1986–1987. 47. Mennonitische Rundschau indexing committee minutes and reports. -- 1988–1991. 48. MB Historical Society of Canada minutes. -- 1977–1990. 49. MB Historical Society of Canada correspondence. -- 1977–1982. 50. MB Historical Society of Canada constitution. -- 1976–1977. 51. Cooperation with other Mennonite Archival Centers. -- 1974–1976. 52. Cooperation with other Mennonite Archival Centers. -- 1977–1978. 53. Society of American Archivists, Church Archives group. -- 1974–1977. 54. Association of Canadian Archivists. -- 1975–1978. 55. Association of Manitoba Archivists. -- 1979–1984. 56. Journal of Mennonite Studies minutes & correspondence. -- 1982–1990. 57. Historical Endnotes. -- 1981–1990. 58. Rundschau Microfilming project correspondence. -- 1980–1984. 59. Mennonite Music Making Project correspondence. -- 1981–1982. 60. D.B. Wiens biography correspondence. -- 1982–1983. 61. Wenger Faith Series correspondence. -- 1980–1982. 62. A.H. Neufeld manuscript correspondence. -- 1982–1986. 63. AMA presentation re. Ethics. Archivist & Donor. -- 1984. 64. Daystar (Buller Films) correspondence. -- 1981–1985. 65. J.B. Toews Film bookings and correspondence. -- 1985–1988. 66. Symposium 1980 re. Influences on MB Theology correspondence. -- 1979–1980. 67. Symposium 1983 re. MB-GC relations correspondence. -- 1982–1983. 68. Symposium 1986 re. Faith & Culture in MB Theology correspondence. -- 1985–1986. 69. Symposium 1990 re. Mennonites is Poland & Prussia minutes & correspondence. -- 1989–1990. 70. 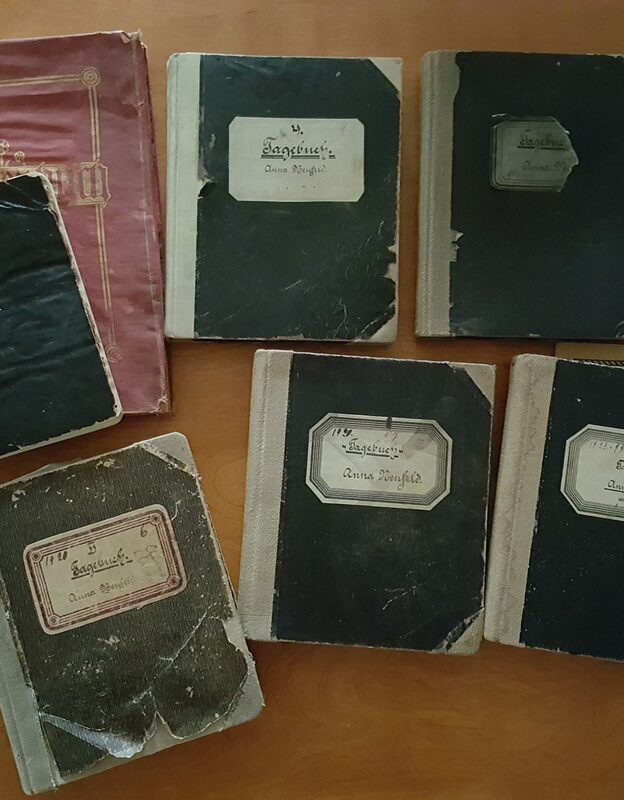 Mennonite Music Making in Canada 1920-1970 Project financial records. -- 1984. 71. Mennonite Music Making in Canada 1920-1970 Project grant application & correspondence. -- 1984–1985. 72. Mennonite Music Making in Canada 1920–1970 Project reports by Doreen Klassen. -- 1984–1985. 73. Oral History Project correspondence. -- 1987. 74. Oral History Project legal agreements & correspondence with interviewees. -- 1987. 75. Mennonite Village listing project. -- 1987. 76. M.B. Centennial (Manitoba Conference). -- 1988. 77. M.B. Centennial (Canadian Conference). -- 1988. 78. Canadian M.B. Conference employees social committee minutes. -- 1989–1990. 79. C.O. Reunions. -- 1991. 80. Mirror of the Martyrs exhibit planning committee. -- 1993–1994. 81. CMBS Finances. -- 1976–1987. 82. CMBS Capital Expenditures (equipment, cabinets, shelves, etc.). -- 1977–1987. 83. CMBS Finances. -- 1987–1992. 84. Personnel File - K. Reddig. -- 1980, 1984. 85. Director’s correspondence. -- 1991–1993. 86. Director’s correspondence. -- 1993–1994. 87. Director’s correspondence. -- 1994–1995. 88. Director’s correspondence. -- 1995–1996. 89. Assistant archivist’s correspondence. -- 1987–1990. 90. Assistant archivist’s correspondence. -- 1990. 91. Archivist’s correspondence. -- 1991. 92. Archivist’s correspondence. -- 1992. 93. Archivist’s correspondence. -- 1993. 94. Archivist’s correspondence. -- 1994. 95. Archivist’s correspondence. -- 1995. 96. Archivist’s correspondence. -- 1996. 97. Director’s correspondence. -- 1997–1998. 98. Bertha Klassen MCC correspondence. -- 1993. 99. CMBS guest book. -- 1978–1999. 100. Director’s correspondence. -- 1997–1998. 101. Director’s correspondence. -- 1999–2000. 102. Director’s correspondence. -- 2000–2001. 103. Director’s correspondence. -- 2001–2002.